It was a roundtrip today for SpaceX's Falcon 9. 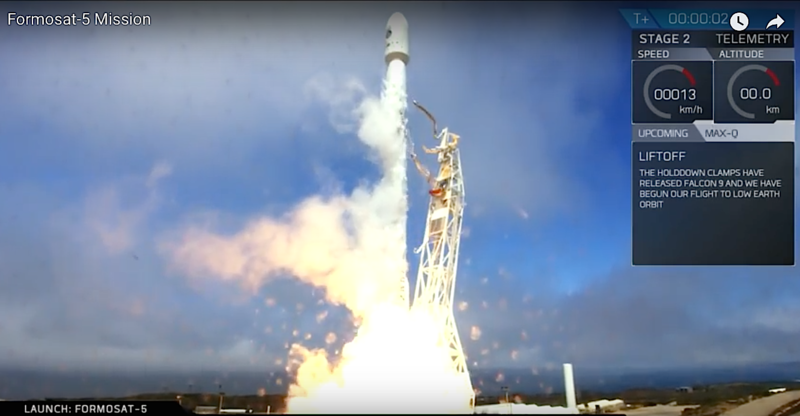 After a successful launch of the Taiwanese satellite the FORMOSAT-5 the Falcon-9 returned to the SpaceX droneship “Just Read the Instructions” located on the Pacific Ocean. The following are the announcements from SpaceX and NSPO. On Thursday August 24, at 11:51 a.m. PDT, SpaceX successfully launched the FORMOSAT-5 satellite from Space Launch Complex 4 East (SLC-4E) at Vandenberg Air Force Base in California. Falcon 9 deployed the satellite approximately 11 minutes after launch, placing the FORMOSAT-5 payload into its targeted orbit. Following stage separation, Falcon 9’s first stage successfully landed on the “Just Read the Instructions” droneship stationed in the Pacific Ocean. "Five, Four, Three, Two, One, Ignition." FORMOSAT-5 satellite was launched by SpaceX Falcon 9 rocket on August 25, 2017 at 2:51 a.m. Taiwan time from the U.S. Vandenberg Air Force Base. 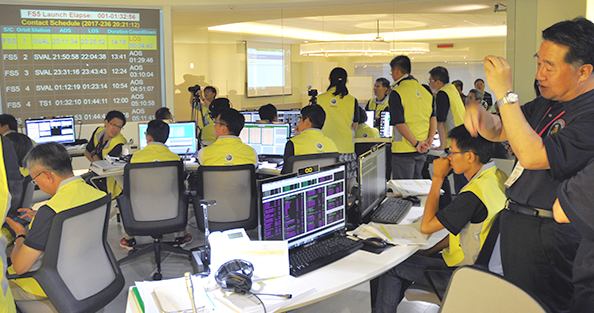 As Falcon 9 was lifted off, the mission operations team at National Space Organization (NSPO) located in Hsinchu, Taiwan and the launch team at launch site cheered together for this special moment. The first stage of Falcon 9 was separated at 2 minutes 35 seconds after launch at an altitude of 90 km. The fairing was ejected 24 seconds later at an altitude of 132 km. 11 minutes 19 seconds after launch, FORMOSAT-5 was deployed into mission orbit. The teams in Taiwan and in the United States congratulated each other excitedly for FORMOSAT-5 launched into space successfully. NSPO received the state vector transmitted from SpaceX and used it to propagate FORMOSAT-5's orbit. The orbit data was sent to Svalbard station to prepare for the first pass. 82 minutes and 56 seconds after launch, the ground antenna of Svalbard station received the signal from FORMOSAT-5 as expected. The success of the first contact marks a milestone of FORMOSAT-5. Cheers! NSPO has something to celebrate. It has been eleven years since NSPO's last launch campaign. 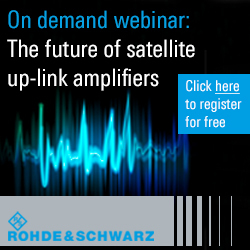 People can't wait to see FORMOSAT-5 provide service in orbit. 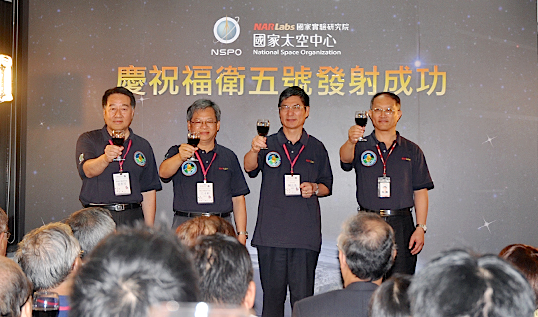 In Taiwan, there were about 200 honorable guests watching the live broadcast at NSPO. The guest includes MOST's Minister Liang-Gee Chen, Narlabs' President Yeong-Her Wang, the ones from government and research organizations, the supporting contractors, and the media. In the United States, Ambassador Stanley Kao, AIT chairperson James Moriarty, and overseas compatriots were invited to view the lift-off of FORMOSAT-5. There were about 300 guests witnessing the historical moment at Lompoc. FORMOSAT-5 is the follow-on program of FORMOSAT-2; it takes images of Earth with 2-day revisit cycle. Once the detailed function checkouts have been completed, which would be one month after launch, FORMOSAT-5 will start to carry out its remote sensing mission and conduct the experiments to explore the ionosphere. FORMOSAT-5 was launched on August 25, 2017 at 2:50 a.m. Taiwan time from Vandenberg Air Force Base by Falcon 9 rocket.